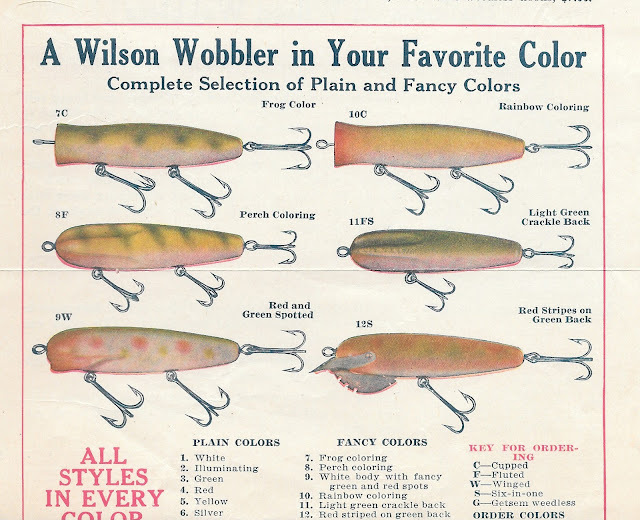 A look at fishing from days gone by.Glimpses of our fishing past through images, ephemera, letters and advertising.Including old Lures, boxes, Tournament casting,Floats,Bobbers,catalogs and tackle companies. I'm always interested in adding to my collection of vintage fishing tackle maker correspondence. If you have any early fishing letterhead or paper to sell or trade, Let me know.Jtejmjordan5@gmail.com No content of this blog may be reproduced without express written consent of the author . On August 25, 1942 William W. Brown of Warren, Indiana received patent 2,293,800. 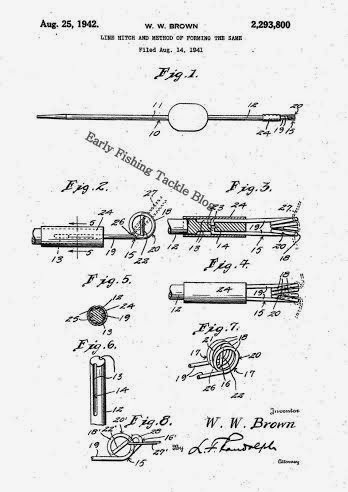 The patent covered the line hitch and the method of forming it.The langauge in the patent papers states that the object of the invention is to provide a hitch especially adapted to be attached to articles of fishing tackle such as floats, sinkers, spreaders and lures to provide means whereby a fishing line can be quickly and easily attached thereto without forming a knot in the line and from which the line may be readily removed. 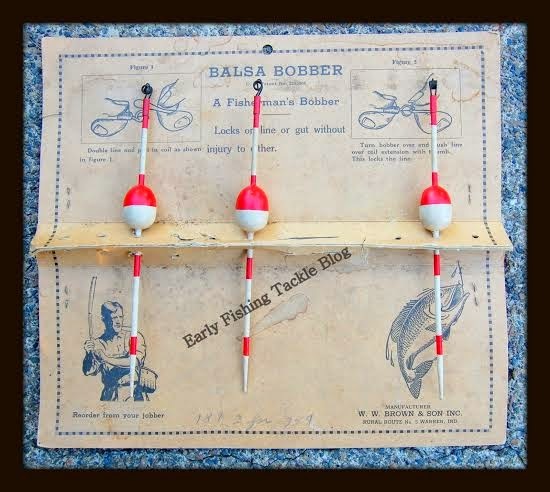 Most bobbers and floats are found without their original box or display card. This makes identifying old bobbers and floats difficult. When trying to identify a bobbers maker, one of the best keys is to look at the hardware or method of line attachment. 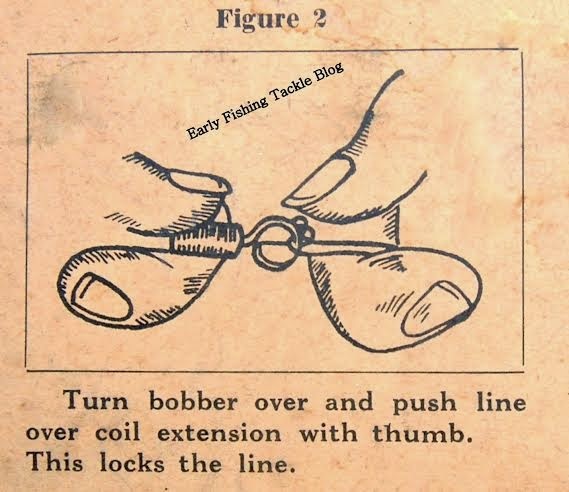 This often times is the only thing that makes a bobber unique. Willliam Brown's line hitch was created from a single strand of resilent wire formed to make a spring coil in which the end convolutions of the spring were wound in the same direction. If you are interested in old floats, check out my old float page. Happy Independence Day. This is my favorite old fly envelope. The graphics embody U.S. patriotism. The American Eagle dominating Great Britains Lion. It is likely this piece was produced in the late 1800's. A time when United States tackle manufactures started producing superior quality fishing flies on a large scale. This lead to the end of large numbers of English Flies being imported to the U.S. Market. Happy 4th. Walter D. Harden was born in Everson ,Pa. March 30 1904. From an early age he enjoyed the great outdoors. He was particularly fond of fishing. In his twenties, Harden occupied the summer months running his families refreshment stand at Whistlepark in his home town of Connellsville, Pennsylvania. During the winter , Walter spent his time in Florida, where he was a very successful guide for fishing parties. One of his favorite spots was Lake Apopka, Oakland Florida. 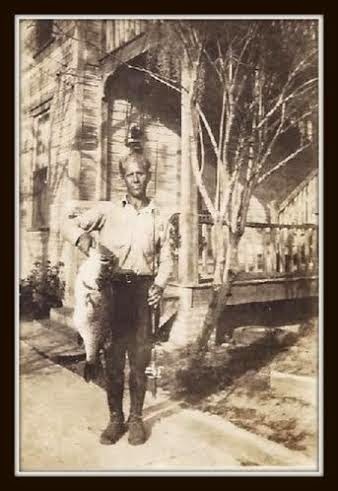 It was there on February 6, 1931 that Harden caught what was recorded to be a World record Black Smallmouth Bass. Walter and his wife Marguerite had set out from the Oakland dock to a certain spot where Harden said the big ones seemed to stay. While using a Creek Chub Bait Company Pikie Minnow in silver shiner color , Harden caught a bass weighing in at 12 3/4 pounds and measuring 29 inch in length. 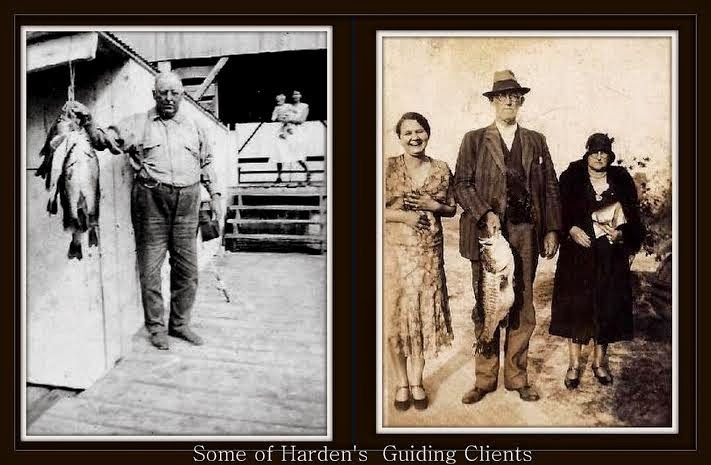 Creek Chub Bait Company even featured Harden and his 12 3/4 lb. bass in one of the companies 1931 advertisements. 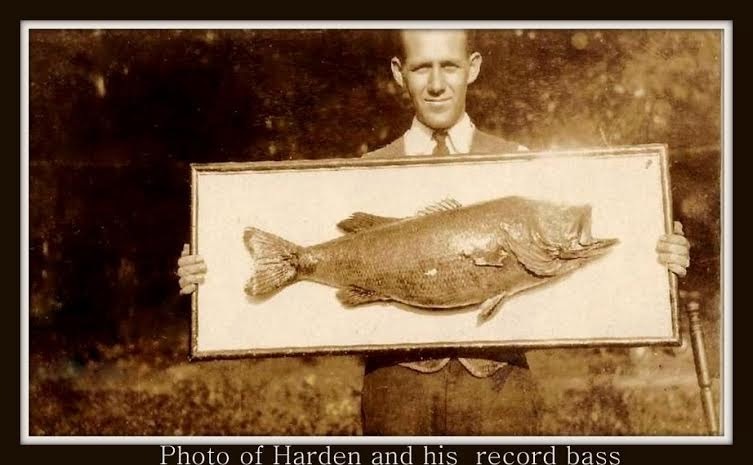 The Creek Chub ad mentioned that large photos of Harden's record fish were available to Sporting Goods Dealers for a nominal charge directly from Walter Harden. 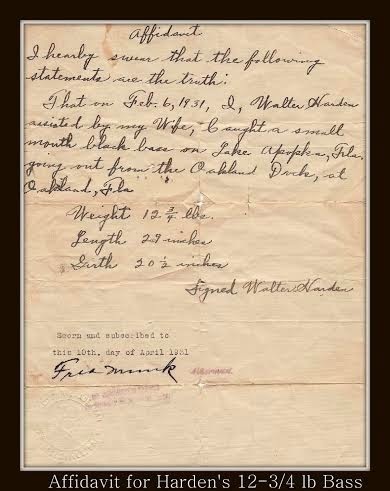 Walter Harden filled out a sworn affidavit documenting his 12 & 3/4 pound catch. This record catch was certified by the American Museum of Natural History, National Sportsman magazine as well as Seth Briggs of the Field and Stream magazine staff. Briggs realized that recent catches of record smallmouth bass in Florida had raised questions regarding the introduction of the species into Florida waters. Briggs discovered the story regarding the planting of Smallmouth Bass in Lake Seneca and other nearby Florida lakes. Samuel A. Hamilton of Huntingdon, Pa. reported that in 1908 as a result of his request , Senator Quay sent 10,000 Smallmouth bass fingerlings which ranged in size from four to six inches to the Eustis Fla. area. With the help of Game Commissioner Dr. Ike N. Kennedy , the fingerlings were placed in smaller well shaded Lakes in Lake County. 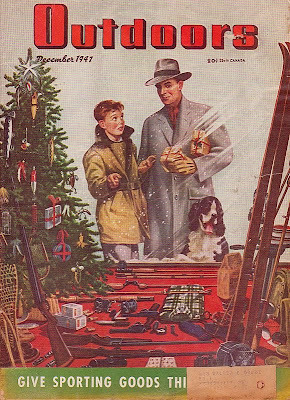 It was believed that Walter Hardens record catch was a direct result of this stocking effort. 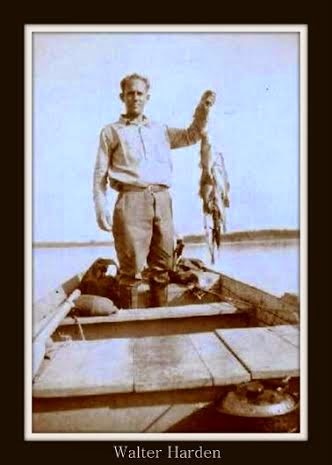 On February 9 , 1932 Walter Harden found himself breaking his own Small mouth bass world record. This time ,while fishing a large live shiner minnow, Harden took a 14 pounder from his special spot on Lake Apopka. Harden had become recognized as a top notch angler. 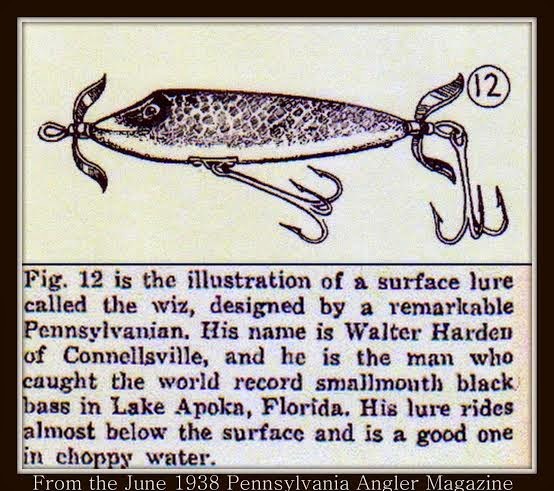 He decided to share his fishing knowledge in a 1936 booklet titled " How to Catch World's Record Bass"
The Weezel . Heddon River Runts in Shore Minnow finishes. Heddon Torpedo, wood Y.P. & Shiner finish. Shakespeare Fishy Lure. Drone spoon. Artie Mack's Magic Minnow. Creek Chub Pikie Minnow, Red & White, Perch and Shiner finishes. Darter 2000 Frog and Silver Flash finishes. Creek Chub Weed Bug, White body -red eye ,Yellow body- green wings. Eppinger's Daredevil , Red & White finish. Peckinpaugh's Feather Minnow. 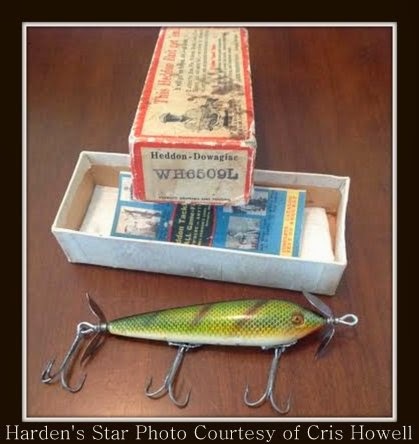 Harden also mentioned that there were a couple of other lures he was sure to have in his tackle box .These lures were a result of his experimentation in changing up hardware on factory made plugs. Harden said that through this type of experimenting he had found a couple of lures that he had changed to be consistent fish getters. He said by changing hardware an angler could find just what the fish would take in a particular locality. Perhaps it was through this experimenting that the Harden's Star and Harden's Whiz were born. 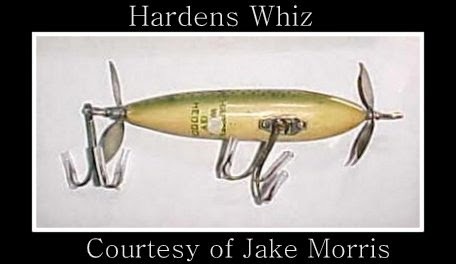 By adding spinners to the Heddon Zaragossa, Walter Harden created the Harden's Star bait and by removing the diving lip and adding spinners to Heddon's Vamp and Baby Vamp , he created the Harden's Whiz bait. Harden's modifications proved to be a success for catching bass in Florida. 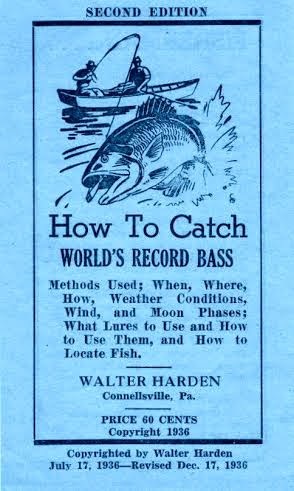 Walter Harden never mentioned the Harden's Star or Whiz baits by name in his " How to Catch World's Record Bass" booklet , but I believe that they were the two secret baits he discussed on the last page of his booklet. 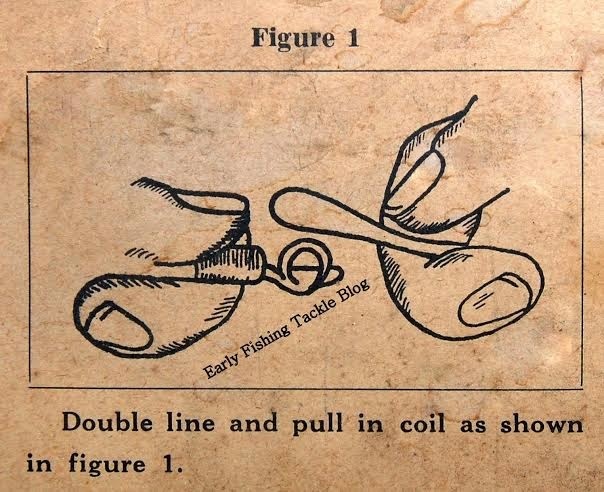 The last page of his booklet was titled 'The Best Two Lures I Have Ever Used". These were lures that he had perfected and found to be the most consistent lures that he had used in the taking of bass. 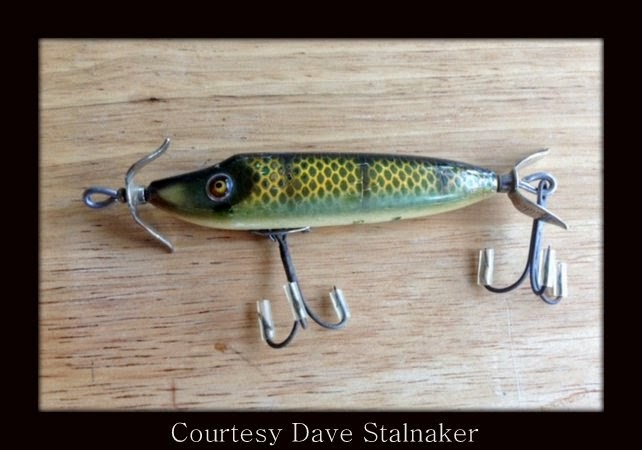 One lure was a described as a surface lure that imitates a live minnow swimming on the surface of the water better than any lure he had ever seen. The other lure was a semi-surface lure that had the same action as the surface lure. He went on to say that he had kept these two baits a secret for the past two years and tested them under all conditions. He claimed they caught more big bass in so short a time than any other lure he knew of. Harden said that anglers may already have the parts to make these baits in their tackle box, as that is how he made his up. For twenty five cents Harden offered a separate booklet which would reveal the secret of these baits and that only the purchaser of that booklet was entitled to the secret. As far as I know, a copy of this twenty five cent secret lure booklet has yet to be found. Heddon made Harden's Whiz and Star baits have been found with Heddon factory paint stenciling on the belly of these baits. Some of these Harden baits have been found in Heddon Lure boxes. 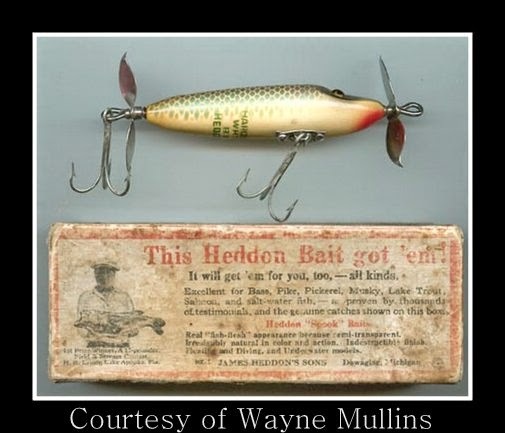 Some of the boxes have Heddon's typical ink stamp on the end of the box indicating the model/color code for the bait. The ink stamp code for Heddon/Harden baits had the prefix WH ( Walter Harden). Other Heddon/Harden baits have been found in Heddon lure boxes with a brown paper label pasted on the boxes end. The brown paper over labels feature the lures name such as Harden's Star or Harden's Whiz and the color of the bait plainly typed on the paper. I have been unable to locate any advertisements for Harden's Star or Whiz baits. It is believed that these baits were specifically designed for fishing in Florida. 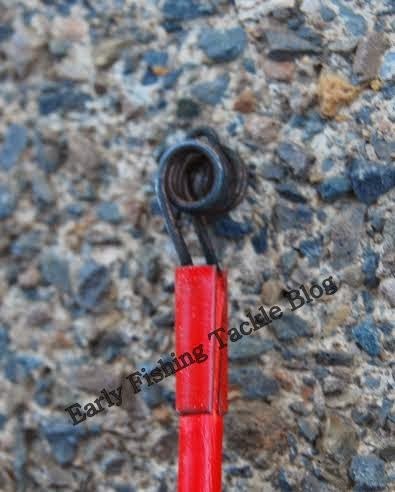 Harden's surface bait was mentioned in an article in the Pa. Angler magazine. Only a small number of Heddon / Harden special baits have turned up in the hands of collectors and are very desirable. Like the production of his baits by Heddon, Hardens Small Mouth Bass record was to be short lived. A larger specimen had not been caught, but his record was disqualified. The disqualification was not based on any deceit or wrong doing by Harden. The disqualification was based on the scientific findings of Ichthyologists Reeve M. Bailey and Carl L. Hubbs. their findings are contained in number -516 Occasional papers of the Museum of Zoology dated February 25 ,1949 - The Black Basses of Florida, with a description of a new species. In their writings Bailey & Hubbs mention Walter Hardens Feb. 9, 1932 fourteen pound smallmouth catch, which was credited by Field & Stream magazine as the record smallmouth bass. Bailey & Hubbs state that the smallmouth bass had long been regarded as an exotic inhabitant of certain lakes in the vicinity of Oakland Fla. by Sportsmen and writers on game fishing. Belief that the smallmouth was established in Florida was based on known introductions of northern stock by U.S. Bureau of Fisheries and by identifications of large fish taken subsequently . These fish were identified by a number of anglers as well as Ichthyologists. The Bailey & Hubbs go on to say that Hardens record was accepted as reliable and mentioned in several pamphlets and books written earlier, including one of their own works, even without having any first hand evidence. Bailey & Hubbs stated they were skeptical of the reported success of plantings of small mouth bass in Florida. Reported examples of large smallmouth bass that had been available for inspection were determined to actually be Largemouth bass, some of which were thought to be stunted and their size and shape had been considerably changed. They went on to say that collections by themselves as well as numerous other game fish/ wildlife agencies and universities had found no smallmouth bass in Florida. with the northern largemouth. They also stated that there was an undue reliance on scale count which was the chief cause of misidentification. They also stated mounted specimens were difficult to identify and were not reliable for accurately determining species. They went on to discuss proper techniques to identify species. They concluded that there was no valid evidence that the smallmouth bass was established in Florida. the importance of accurate identification. The fishing community must have accepted Bailey & Hubbs findings. 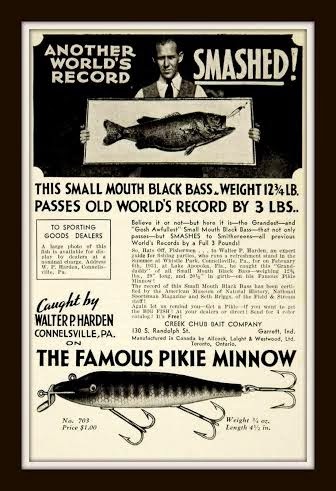 By 1950 Field & Stream magazines- Table of World Record Fish Catches- listed the record for Black Bass, Smallmouth, simply as Previous Record Disqualified. Although his World record did not stand the test of time. There is no doubt Harden was an outstanding Bass fisherman. 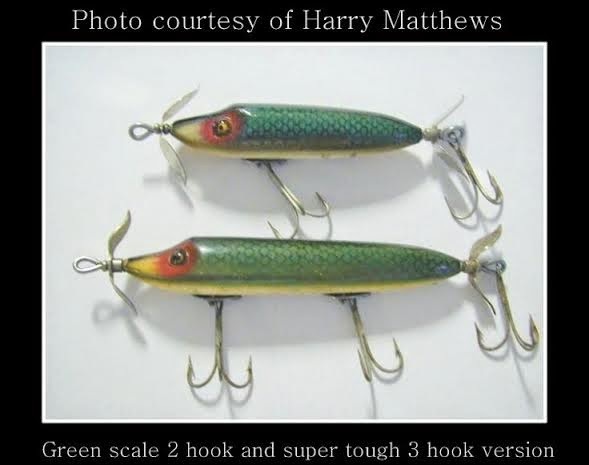 Hardens special Heddon baits continue to draw the admiration of fishing lure collectors and are prized among those lucky enough to have an example in their collection. I'd like to thank all those who shared information and photos of Harden baits. First and foremost a big thanks to Bill Holsing ( Grandson of Walter Harden) who provided original images of Walter Harden and family history. 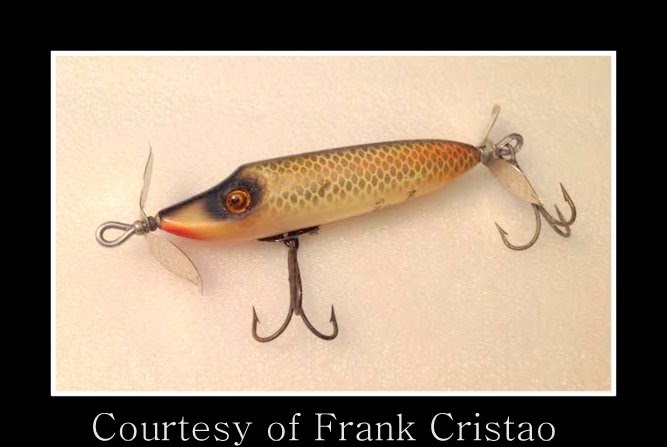 Lure photos provided by Frank Cristao, Cris Howell, Harry Matthews , Jake Morris, Wayne Mullins and Dave Stalnaker. I'd also like to thank Walter Harden's niece Fay, who provided family history. 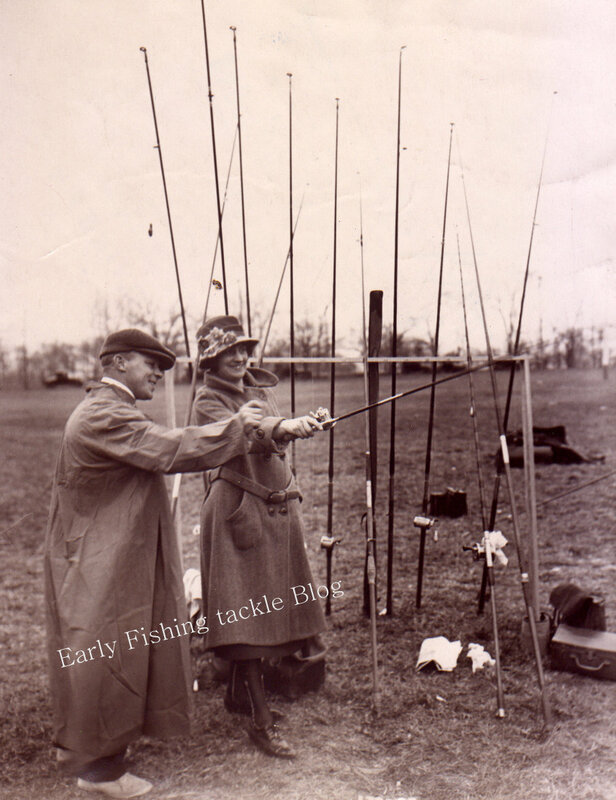 Here is a great 1923 photo of World Champion surf caster Harold Lentz and Mrs. C.A. Davies of Brooklyn, New York. Davies made a clean sweep in all women's events of the New York Casting Clubs annual Spring tournament. In 1922 Lentz set a World's record in surf casting with a cast of 465 feet. Lentz of Philadelphia, Pa. was a member of the Angler's Club of Ocean City as well as a member of the Dover Fishing Club. Lentz was quiet the celebrity in the 1920's. He was matched up in skills competition against the top athletes of the day. Harold went up against Pro golfer and one of the worlds top players, Gene Sarazen. The contest setting was an eighteen hole golf course. Lentz used his nine-foot surf rod and a four ounce sinker, Sarazen used his golf sticks. Harold hit the final hole , while the pro-golfer was still far behind. Lentz even took on The Sultan of Swat ,George Herman Ruth. In a pre game exhibition at the Polo Grounds ,New York City, Lentz & Ruth went head to head. Babe with his hickory baseball bat "Darlin" and Lentz with his Surf casting rod. Lentz amazed nearly 30,000 fans as well as Babe Ruth himself, by casting his four ounce pear shaped lead weight nearly thirty feet farther than Ruth could hit the baseball. Lentz even pitted his angling skills against Olympic Gold Medal winner Ethelda Bleibtrey in a 1923 Mermaid angling contest. Bleibtrey was the first ever American to win a gold medal in swimming. In 1920 she won all three women's gold medals available at the 1920 Antwerp Olympic Games. The mermaid angling contest was the idea of James A. Cruiskshank, editor of the American Angler. The idea was to pit the strongest female swimmers of the day against Champion anglers. The Mermaid wearing a harness, would be attached to the end of the anglers line. In order to win the angler would need to reel in the Mermaid within the so called gaffing distance of five feet. Despite his casting triumphs over pro golfer Sarazen and power hitter Ruth. Harold Lentz could not land the female Gold Medalist. Harold Lentz had wonderful and long casting career. Twenty years after his 465 foot World record cast, Lentz made a record setting comeback. On August 14, 1943 acting as the anchor for the Dover Fishing Club ,Lentz became the first caster to average more than 500 feet per cast in the National Cup tournament in Ocean City New Jersey. Harold made 5 casts totaling 2,583 feet and ten inches. One of Lentzs' five hundred plus foot casts was launched in the direction of a passing overhead Navy dirigible that was patrolling the N.J. Coast for U-boats. The strength and direction of Lentz's cast caused at least one on looker to briefly wonder what would happen if Harolds casting weight struck the passing Airship. December 1947 Outdoors Fishing Christmas Cover . What more could a young boy want for Christmas. I love the old plugs used as tree ornaments. Wishing you all a very Merry Christmas. Hope you all find a nice plug under the tree.